The wife of former All Black Julian Savea claims to have received death threats and says she fears for her family's safety in the aftermath of the public scolding her husband has received over the past weeks. 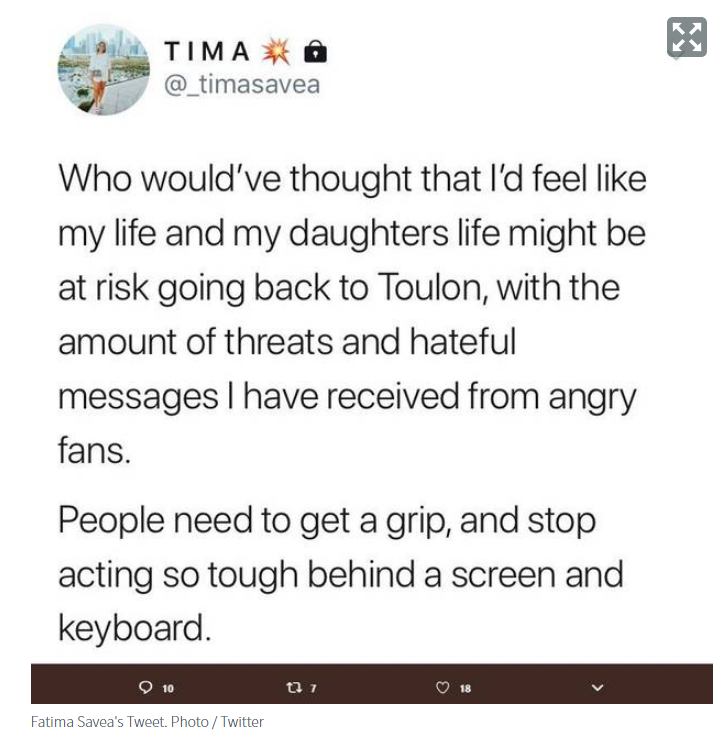 Fatima Savea, who is set to rejoin her husband at Toulon in the south of France after spending some time in New Zealand with the couple's one-year-old daughter Jude, posted on Twitter: "Who would have thought that I'd feel like my life and my daughter's life might be at risk going back to Toulon with the amount of threats and hateful messages I have received from angry fans." The post was shared by a Toulon fan page La #TeamRCT. The winger, who also played for the Hurricanes in the Super Rugby competition, has been the target of a series of verbal and social media attacks by Mourad Boudjellal, the millionaire comic book tycoon and outspoken owner of the club. Two weeks ago, Boudjellal told local media he would tear up Savea's contract and "ask for a DNA test" after another disappointing performance from the struggling winger - who is reportedly one of the top earners at Toulon. "They must have swapped him on the plane [when he joined from the Hurricanes last year]. If I were him, I would apologise and go back to my home country," Boudjellal said. Current and former players came to Savea's defence after Fatima revealed that she had been the victim of vile attacks on social media. "Take a minute to think about how your words can affect someone's life and their mental health," she tweeted earlier. "And people wonder why mental health in rugby had become a big problem. Take a minute to be considerate of people's feelings instead of bashing them behind a keyboard or phone screen." Boudjellal has become known for his temper, with All Black Andrew Mehrtens comparing the Frenchman to a "kid playing fantasy football" and detailing his obsession with signing big-name players. Savea has not featured in either of Toulon's last two matches - victories against Pau and Perpignan. After the latest match, Savea, dressed in a black T-shirt and tracksuit pants, joined his team-mates in a huddle on the field. The club are in 10th place on the French Top 14 table. and next face Montpellier at home. The mental health problem is rugby fans.